In the post-apocalyptic world of Neuroshima the Moloch have sent a convoy of killer robots to destroy New York. Will they succeed or will the divisions of Outpost soldiers save they day? 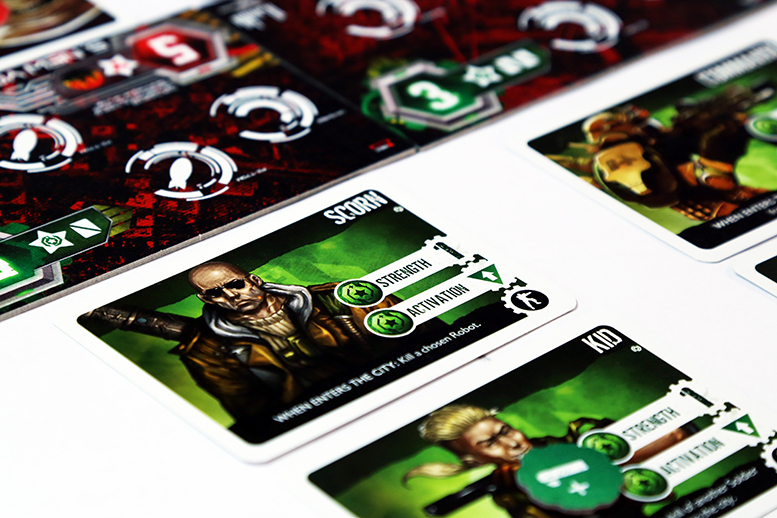 Take control of either faction in this asymmetric two-player game. What is Neuroshima: Convoy like? 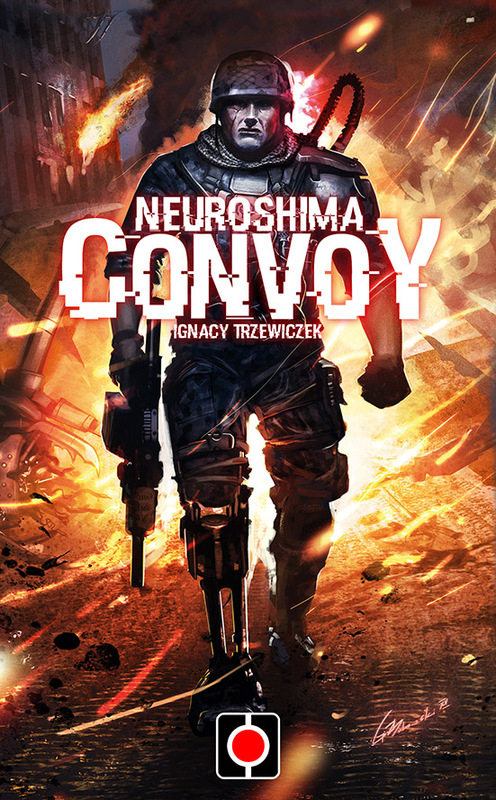 Neroshima: Convoy is a two-player game that takes place in the thematic universe of Neuroshima, a post apocalyptic world where man, mutants and robots fight each other. In Convoy you will either play as the evil robot faction (called Moloch) bent on destroying New York, or the courageous human group (called Outpost) fighting to prevent this. The game plays very different depending what side you are playing on. You will have different goals and different ways to play cards. The Moloch win if they have at least one robot remaining in New York after the last battle, or at least one card left in their deck. In every other case the heroic humans have prevailed and the Outpost win. As the game progresses the two factions will be fighting over different districts in different cities. The five different cities have different number of districts. Each city also has a different number of “slots” for each player that describes the maximum number of units and buildings a player can have there. 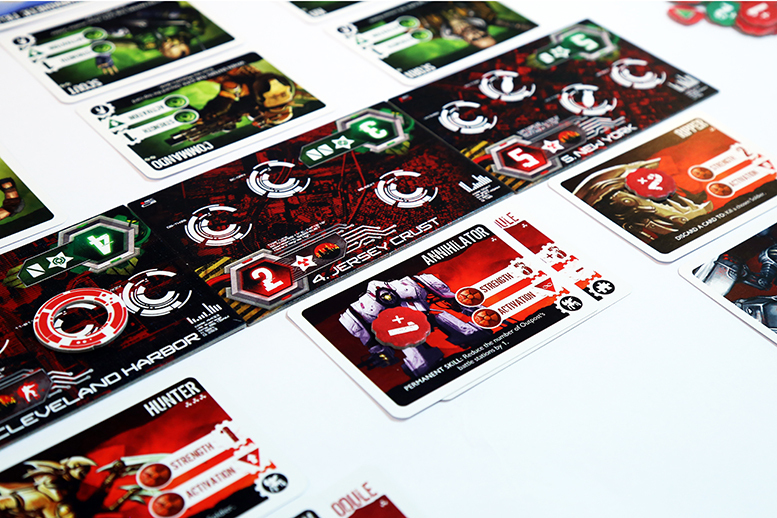 Each player starts with a 30 card deck containing units, buildings and event cards. The Moloch deck will also have modules in addition to this. Players start their turn by drawing two cards. They then proceed to play units and buildings from their hand on the current or future city. First the Moloch player plays all the units he or she wants, then the Outpost player does the same. After that the Moloch player has a chance to play “modules” on the killer robots. After units and modules have been played a battle will ensue in the current city. The winner is simply the player with the highest strength there (counting units, buildings, modules and any additional bonuses). The winning side will get a reward based on what district it is, and the loser will get nothing. Play continues until the last district of New York has been fought over at which time the game will end. Regardless of who wins, the district is demolished and the next district will be fought over the following round. If it is the last district in a city then play continues to the next city (leaving all the units behind, except for the Moloch player who gets to move one unit forward to the next city). The two factions play very different and it’s a nice challenge to try out both of them. Overall the Moloch player has an easier time getting more units into play and moving them around, but they have to be very careful not to run out of cards. The Outpost player can be more reactionary to what units gets played but has a harder time moving his or her units around after they are play. Ignacy Trzewiczek is a great designer and he makes high quality games. Neuroshima: Convoy is no exception. It oozes theme and the mechanics tie well into the struggle of man vs. machine. The two sides are evenly balanced even though the game plays asymmetric. The game has a lot of interesting tactical choices, because you will not be able to win ever fight. You have to play the game a few times to really appreciate, but once you know the cards, you can have some very close and thrilling match-ups. I do however think that it is a game that requires both players to be at the same level to be good, and that it might lose it’s appeal after many plays. The more you play this, the more you’ll love it. Spend the first few games getting familiar with the two different factions and you can have some really intense games. The theme come through so well. It’s easy to see Ignacy’s love of the Neuroshima universe. The art looks good and feels very cohesive. The comic book style suits it very well, and is true to the rest of the Neroshima universe. Overall the quality is very good, nice thick card stock on the cards. Nice tokens. Rulebook is also pretty good, but could be better. Nice with card clarifications though. The core rules are fairly uncomplicated. The asymmetric gameplay and the number of cards you have to read and understand does add a little to the overall complexity of the game. Tabletop Together and dachshund owner, sci-fi geek, trekkie and whovian. Lover of medium length, thematic, silly (in the good way), worker placement style games. A sucker for beautiful art. Generally just a big lovable teddy bear.